What is a Pivot Table - How to Make it - Something New Everyday! Excel pivot tables are very useful and powerful feature of MS Excel. They can be used to summarize, analyze, explore and present your data. In plain English, it means, you can take the sales data with columns like salesman, region and product-wise revenues and use pivot tables to quickly find out how products are performing in each region. As I said before pivot tables are very powerful and useful. There are numerous uses of pivot tables that we can talk about them until Christmas. 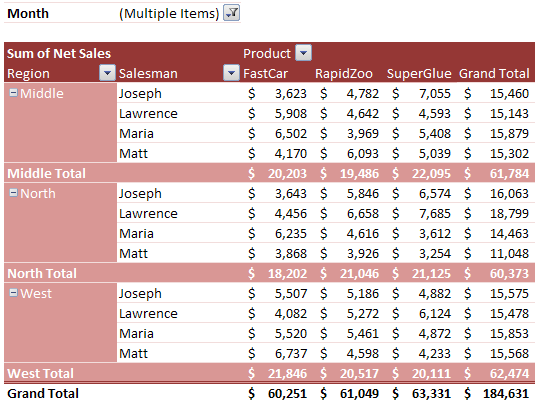 Summarizing data like finding the average sales for each region for each product from a product sales data table. Filtering, sorting, drilling-down data in the reports without writing one formula or macro. Linking data sources outside excel and be able to make pivot reports out of such data. Let us make your first pivot table. We will use example data in the following format. Download the excel pivot tables tutorial workbook with the data. Select the data range from which you want to make the pivot table. To insert a new pivot table in to your spreadsheet, go to Insert ribbon and click pivot table icon and select pivot table option. 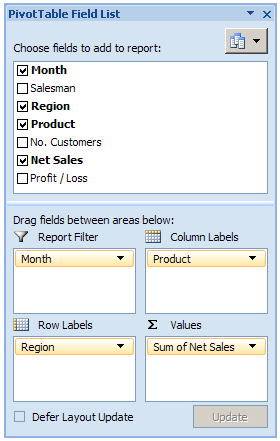 Step 3: Select the target cell where you want to place the pivot table. For starters, select New worksheet. Excel will display a pivot table wizard where you can specify the pivot table target location etc. Select "New worksheet" option and your pivot table will be placed in newly created worksheet. The pivot report UI is very intuitive and sandbox like. To make powerful analysis, all you have to do is drag and drop fields in to the pivot table grid area. In excel 2007, you can also control this by using the "Pivot table panel". The pivot report is divided in to header and body sections. You can drag and drop the fields you want in each area. The body itself contains three parts. Rows, Columns and Cells. You can use any fields in these areas too. And the outcome is this pivot report. It might be a bit difficult to understand how this works. But believe me, if you have seen any reports or worked with any other reporting systems, then the idea of pivot tables, pivot reports and pivot charts becomes quite simple to you. You can use the excel pivot table features to make a more complicated pivot report like this in no time. You can apply any formatting to the pivot tables. MS Excel has some very good pivot table formats (and they are better in Excel 2007 and 2010). You can easily change the pivot table summary formulas. Right click on pivot table and select "summerize data by" option. You can also apply conditional formatting on pivot tables although you may want to be a bit careful as pivot tables scale in size depending on the data. Whenever the original data from which pivot tables are constructed, just right click on the pivot table and select "Refresh Data" option. Making a pivot chart from a pivot table is very simple. Just click on the pivot chart icon from tool bar or Options ribbon area and follow the wizard. Click here to download the excel pivot tables tutorial workbook. [.zip version of tutorial here]The workbook has sample data and one pivot table in it. You can play with it to learn more.